Until recently, if you’d asked me if I ever wanted to make falafel at home, I’d have said “sure, one day” but what I meant was “nah, why bother?” I was certain that falafel was fussy to make and had a long ingredient list. It probably related in some way to a fritter, meaning that it was bound with eggs and flour, and probably had breading on it too, all pesky steps and this is even before you get to the peskiest of all: deep-frying them. I figured that it’s one of these things that there as many recipes for as there are people who make it, thus whatever I came up with would be wrong by default – too firm or too soft, with chickpeas instead of favas or vice-versa — no matter what. But this isn’t the whole truth. The fact is that below 14th Street, there are two locations each of Taim and Mamoun’s every time I even distantly considered whether I needed a homemade falafel recipe in my life, I knew I could get a perfectly executed sandwich in my hands before I even wrote out a grocery list. Hey, I’m not proud of this. I pride myself on being a curious person in the realm of cooking so it’s pretty pathetic that I had falafel all worked up in my head as this highly complex thing and never once, you know, read a few recipes. Had I, I’d have learned many extremely cool things about falafel such as the fact that while you do need to start with dried chickpeas (come back! ), you don’t even have to cook them, or not in the classic long-simmered way, to make it. You soak them overnight in cold water, grind them up with seasonings and herbs, pack them into spoonfuls, fry them in less than an inch of oil in merely a few minutes, and that is it. There’s no egg. There’s no breading. It’s vegan, it’s gluten-free, it’s dirt cheap, and it’s easy, I mean criminally easy, to make. And I had to do it immediately. In real life, however, I waited until the first night of Hanukah for two reasons, one, fried food is basically the only rule of the holiday, and two, a family member has recently gone vegan and I weirdly love the challenge of trying new menus (obviously, the meal ended with this cake). Making falafel for 10 people was so easy, I had spare time to kill and so I decided to make pita bread too. Okay, I’m a little nuts but the fact is that 90% of storebought pita is dry and terrible and even the worst homemade pita, the couple that refuse to puff or puff erratically, as you see here, is still delicious. I know many of us dread frying foods but for whatever it’s worth, making falafel involves none of the headaches that other fried foods do. You don’t need a lot of oil (3/4″ depth is fine.) You don’t need to stress over anything burning on the outside while still being unsafe to eat (fried chicken, I’m looking at you) in the middle. You don’t need to use an entire roll of paper towels and every counter in your home to drain the falafel because they weirdly don’t pick up much oil at all. In fact, I measured the oil I used before and after making falafel and found that each ball picked a scant half-teaspoon of oil. You put 3 to 4 in a pita. They are shockingly unheavy and ungreasy. This makes 19 pieces of falafel about 1.5 inches in diameter, using a 1.5 tablespoon cookie scoop to measure. I estimate 3 to 4 for each medium-large pita sandwich portion, to make 4 to 6 total, but we preferred only 3 in each. This recipe scales easily; I’d recommend doubling it for a crowd or even just to stock your freezer for a future falafel night. The night before: Place chickpeas in a large bowl and add enough water to cover them by a few inches. I like to put 1 tablespoon of kosher salt per pound of chickpeas in this water too; it will not toughen the beans or slow down their cooking time, it simply seasons them. Let the chickpeas soak overnight. 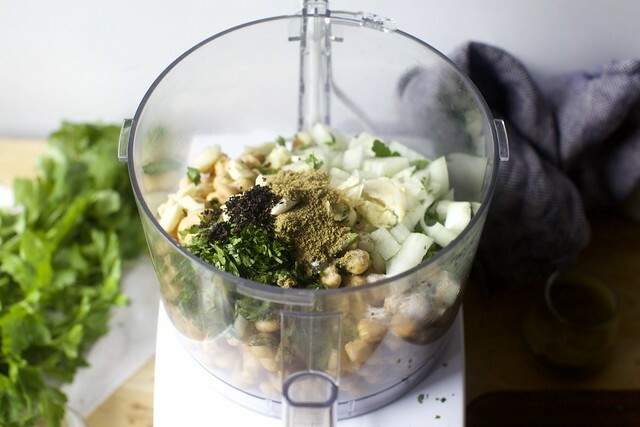 An hour or so before you’d like to eat falafel: Drain the chickpeas well. In the bowl of a food processor or a really strong blender, place the onion, garlic, and herbs and pulse the machine until they’re coarsely. Add the drained chickpeas, salt, and spices and process until blended to a fine chop but not pureed. You’re looking for a texture like cooked couscous plus some slightly larger bits throughout. You should be able to pinch it together into a shape that holds. 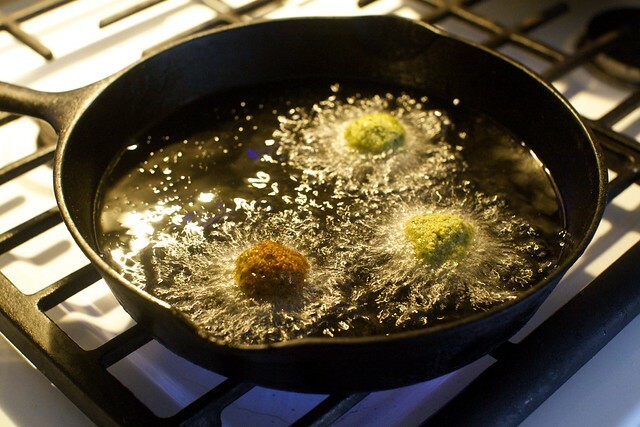 To cook the falafel: Heat 3/4 to 1-inch of oil in a medium-large frying pan to 375°F. Fry about 6 falafel fritters at a time, turning them over once they’re a nice toasty brown underneath, and removing them once the second half has the same color. This took me about 3 minutes per batch. Drain on paper towels and repeat with remaining fritters. To serve: I like to split open a pita and start with a little tahini sauce (below) and a spoonful of salad at the bottom before adding 3 to 4 falafel fritters. Stuff and finish with a more generous scoop of tomato-cucumber salad, more tahini sauce, a hot sauce of your choice, and pickles, if you wish. To make tahini sauce: I have trouble nailing down precise measurements measurements for tahini sauce because you really want it to taste, and tahinis vary between brands. But, it’s roughly this for this amount of falafel: 1/2 cup well-stirred tahini + 1 clove garlic, minced or finely grated + Juice of half a lemon, plus more to taste + salt, to taste + water, as needed, to thin tahini into a sauce. It’s not strange to need at least as much water as you do tahini to keep it loose and spoonable, but I add it a tablespoon at a time, whisking to combine, tasting along the way. Some falafel recipes contain flour (to make it heavier and more firm), some contain baking powder (for fluff), but after making a batch with both, I found I preferred the purist route, with neither. Should you wish to add flour, add 1 tablespoon at time, frying off a ball after each addition until you get the texture you wish, not going further than 4 tablespoons or it will be excessively leaden. To add baking powder, you could use 1 to 1 1/2 teaspoons for the whole recipe below, but personally, I found the change in fluffiness nominal, and the texture without it not lacking at all. I’d forgotten how easy it is to make pita bread and have proceeded to make it 4 more times in two weeks, sometimes for falafel and other times just to go with a really great soup or stew. The recipe was fine as written but I’ve cleaned it up and simplified it because it’s easier than it made it sound. They rewarm well or can be kept warm in a basket lined with a napkin or cloth towel for a while. You know you wanna. You guys, I am that weird home cook that finds chopping things cathartic which is why in the 10 years since my mother-in-law bought me one of these (she uses it to make picture-perfect Salad Olivier and vegetable soups), I hadn’t once used it. Well, I looked at the great mass of cucumbers and tomatoes I wanted to chop on Hanukah and decided there was no time like the present to give it a spin. It bashed up the tomatoes a bit but I regret nothing. Never made falafel…but eaten plenty of them :) Thanks for the inspiration! Will definitely be trying your recipe. Thank you, Deb! I’ve been trying to spread the word about how easy it is to make delicious falafel, but it’s been slow going, so I feel much better about the whole thing now that you’re on board. I have found a cooking method that’s even easier than frying AND that produces results I like better: a waffle maker, brushed with just a bit of oil. Produces lots of the crispy edges I love on falafel, plus wells to hold feta, tomatoes, and cucumbers! I don’t make full-sized falwaffles (or waffalafels, as you prefer), but scoop about one or two balls’ worth onto each quarter of my round waffle maker, leaving space in between them. Also – I find it doesn’t quite taste like falafel to me unless there’s a little turmeric, so if anyone finds this recipe to be missing a little something, that’s where I suggest starting. Excellent idea! Used my iron to make hash browns too. Whoa – brilliant! I was lukewarm to this recipe because my house always smells like used oil after I fry something but I love to waffle-ize things. Nicely done! “Falwaffles” and “waffalafels” both made me laugh super hard. The names alone make me want to test out that method. YES! Another reason to keep the waffle iron. I give it side eye often because I thought it only did 1 job. Thank you dear friends! I always get chef-mad when I have to stir up tahini but I finally dumped/scraped it all into a little food processor I have and let it rip. Perfect. Thank You big time for this idea. Flat sounds so much easier to eat, too. … though I’ll try Deb’s version too! Pan-frying isn’t as scary as deep-frying, and as she points out, raw falafel mix won’t kill you. I made Falafel once, and the balls crumbled into little bits as they fried…, your recipe looks perfect! Making this when my kids get home.. or they can make it for me.it looks perfect.. ( of course it looks perfect.) thank you. This was a common refrain I found in comments online. Did you start with dried? How much did you grind it? No, I didn’t start with dried.. must have been canned. It was a long time ago,and can’t even remember where the recipe came from… that’s OK.. now I have this one. I made these yesterday, and started with canned chickpeas because that’s what I had and what I read hinted that it should work. Because I have a deep fryer setup, I used that, and they instantly disassociated, which ruined couple quarts of (cheap) oil. Then I went to the recommended 1″ of oil in a pan and, yeah, same result. I added an egg and got an acceptable result, but evidence mounts that using canned was the problem. At least, that’s my hope because I’m going to try again. We made decent ones for years, starting them in oil and finishing in the oven. We moved to a drier climate and they just fall apart in the pan every time we make them now (coincidence?). We always used flour, baking powder, and a little egg. It never occurred to me not to add those things. Thanks for giving me new hope! Looks great! Would it be possible to bake them in the oven instead? You can, however, I do not find that they get the good color contrast (I’m all about the dark brown edges vs. green interior) and crunch. I know frying can be really annoying, but I listed out the reasons above I found this to be the least stressful, least heavy things I’ve deep (actually shallow) fried. We’ve had success baking them in a well oiled cast iron pan for good flavor and color. I love making falafel for all of the reasons you list above and I look forward to trying this recipe! Just last night I was saying I wanted to make falafels and would be looking at recipes soon. Perfect timing!! I am still on falafel and hummus overload from my 12-day trip to Israel in the spring. However, one can never eat enough flatbread! Yum. I have chickpea flour. What is the volume of the ground less your way? It’s not the same. 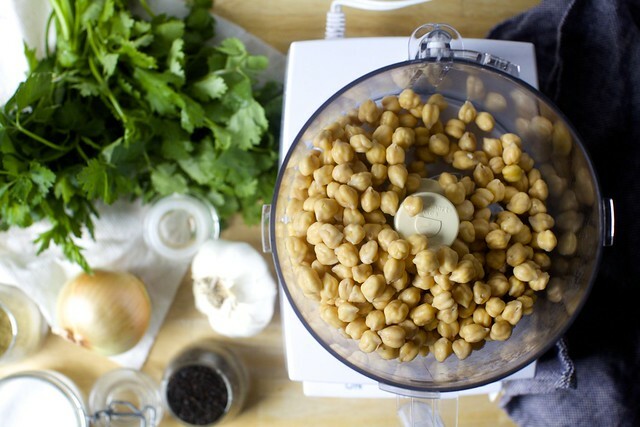 You’re not grinding the chickpeas to a flour here. Yes it is relatively easy and very tasty. A Lebanese friend of mine made the tahini sauce and was spectacular…I didn’t get the recipe because,like many home cooks, it is a pinch of this and a dab of that and not too much of this. I made my hummus which has crushed pistachios in it. Really nice added texture and taste. I’d dearly love to see the recipe for the pistachio-enhanced hummus! I have never tried falafel from chickpeas that are soaked but not cooked. Do they finish cooking in the pan? Or is there a step missing? I never make round balls — I make falafel patties. I find this is both easier to cook and eat. I like to put some Tahini in the mix and serve with tzaziki, a Greek yogurt sauce. They cook when they fry. I’ve come here looking for a falafel recipe at least a dozen times over the years. You have such a great repertoire of hummus/Israeli salad/tahini foods that I always think you have falafel floating around too. I usually end up falling down a Google rabbit hole until I settle on a recipe, but I’ve never been thrilled with the outcome. And now finally! Thank you for presenting us with a version I’m positive will be perfect. Quick question: do you dress the Israeli salad with any lemon and oil or do you add it to the pita as-is? I always love the taste with the dressing but find it can make the pita sandwich a little drippy. I dress the salad with lemon, salt, pepper and olive oil, like so. Argh. I love felafel and even more I love tahini sauce, but my tongue breaks out in hives from tahini (geographic tongue). It’s miserable, and it’s cumulative, and it’s making me so sad to see this today when my tongue still hurts from last night’s dinner which had tahini dressing on the salad. Sigh. Maybe someday, it looks so good!!! It can be made without tahini sauce. A lemon garlicky yogurt would be great. Yes to this suggestion! Plain yogurt + lemon + garlic + chopped cucumbers (for a little crunch) + salt is one of my favorite things to have with falafel or chicken, or anything stuffed in a pita! Have you tried sunflower butter? It might be a good sub too! You mentioned freezing these to have on hand for quick falafel and I’m all about that – is there anything I need to know about freezing them? Should I fry them for a shorter period of time, or freeze them raw? Would reheating in the oven on a rack work? P.S. I wanted to thank you for your pumpkin cinnamon roll recipe – it’s become a fall-slash-holiday-season tradition! No, freeze them fried. It would hardly save time to have to heat up a pan of oil once you defrosted them. You could reheat them on an oven rack. Shouldn’t take long. And thank you! Jessica, I hate to contradict Deb on anything, but I freeze mine raw. That way you still get hot and crunchy fresh-cooked felafel, which is one of my all time favourite meals. I make mine with split dried fava beans instead of chickpeas (no skins, also cheaper). I usually semi-defrost them spread out on a baking tray (I also freeze them on a tray before bagging them up) but don’t worry too much if they’re still a bit frozen in the middle – that will cook out. Great for a fast week-night dinner. I freeze mine raw too – works great! You may have answered this already but can you omit the cilantro or use the paste in a tube, I really dislike it! I was wondering what you might suggest as a replacement for cilantro. One of my kids and I both have that thing where cilantro tastes like soap. More parsley instead? Use more parsley or skip it. My daughter and I both have the cilantro-soap thing too and sometimes I just add some chopped celery leaves instead…has a slightly mineral taste that I like with the parsley too. I made it and skipped it (soapy here too). I may have added a smidge more parsley, but it was fine. I split the difference with parsley and cilantro because I like both here, but either are traditional in different places, so if you don’t like one or the other, I’d actually recommend doubling up on the one you like to keep that green hue and the moisture the herbs bring. My husband spent a long time perfecting his falafel methodology—his two key tricks were 1) using uncooked chickpeas as you recommend, but also 2) to grind it through a meat grinder attachment on our Kitchenaid. The grinding instead of food processing gives it the texture you’d expect in a restaurant. For a nifty shortcut, I soak my chickpeas, then drain and freeze them. That way if I last minute decide to make falafel, quickly thaw and proceed with the recipe. Don’t notice any difference in taste/texture than the usual. I do this also – freeze the soaked garbanzos. I cook for just me so I freeze in quantities that I can make 3 or 4 when the craving strikes! I like them best fresh vs frozen/reheated and really, they are so quick when you have the soaked beans. I am going to try them in the waffle iron and also, I have an air fryer since I last made them and wondering how that might work. Experimentation fun! I made these in my air fryer first time (actually Cuisinart toaster oven-air fryer … not sure how different that is than the actual air fryers). In the past when I fry them in oil, they are just this side of falling apart until they hit the oil when they hold together. So for the air fryer, first I prefer a flatter slider like “patty” so that’s the shape I use. And I did add a bit of beaten egg for some extra binding. 375 in my unit for about 12 minutes and they were perfect. I noticed that the Fawafel recipe has olive oil which I think makes the mix more batter like. Looking forward to trying that also. ooooh, that’s clever! Will definitely try. Your recipe is quite similar to America’s Test Kitchen’s book “Vegan for Everybody” page 126. They do use more cilantro and parsley and they add a bit of cinnamon. Also they make theirs in one inch wide disks. I don’t know much about falafel, but from making this recipe, I can say you are right. It is not that much trouble and you can enjoy it at home any time. For anyone interested there is a recipe called “Falafel Waffles” from the Berkeley Bowl Cookbook page 155 that I absolutely love. It is served with a harissa yogurt sauce and a carrot and cuke tangy slaw. Really worth hunting down. Same flavors as real falafel but no frying. Plus, fast and easy- it starts with canned chick peas. If you like falafel, you will love falafel waffles. Thanks for all you do, Deb! Looking forward to trying this! You don’t mention it, so I assume the chickpeas don’t need to be peeled? And that not peeling doesn’t lead to a gritty texture? That’s only something I do for hummus, which we want smooth. Falafel is supposed to have a rough texture. I like to use my falafel mix for “bean burgers”. I mix it with tofu and saute them without the coating. I will definitely be trying this recipe! You are my go to online recipe finder. And I own and use both of your cookbooks. Thank you for sharing your gift! I use peanut oil. I find it deep fries very nicely, and tastes unheavy. I often use peanut oil for high temp ‘frying’ or semi-frying. No one seems to mention it much anymore, except for Asian blogs. I’ll try to be more aware. Thanks. Deb recommends stuffing the pita with pickle alongside the felafel, but doesn’t specify what is meant by “pickle”–a broad category. In Jerusalem (and elsewhere in Middle East), the “pickle” in a felafel-pita is likely to include pickled turnip. So easy to make… some beet spears for color and flavor, some vinegar (unless you want to ferment)… I’m partial to David Leibovitz’s recipe (easy to google)… Yes, extra work, but you pickle the turnips ~week ahead…. many moons ago i worked at a software company around the corner from a mediterranean restaurant. i’d often go for a chicken shwarma wrap and greek salad at lunch. the pickled turnips were one of my favorite parts! of course, back then google wasn’t what it was today and i went a long time without actually knowing what i was eating, wondering in vain what vegetable was hot pink, lol! (i’m sure i could have just asked, but i was too shy.) it’s been a long time since i’ve been down that way, so it’s about time i try to make my own at home. thanks for the suggestions! When I was looking for recipes for vegan “south of the border” foods, I came across a recipe for acaraje (“riders on horseback”). These were basically balls made from ground up black beans, seasoned with cumin and other spices, and deep fried in palm oil — basically South American falafel. Those were the “horses”, and the “riders” were shrimp embedded in the balls. (Obviously I left those out to make the dish vegan; formed the balls around macadamia nuts instead.) They were quite good, and very well received. Funny, I was absolutely thinking about trying that next! Didn’t know the dish already existed, but shouldn’t be surprised. I’d skip the shrimp too. Acarajé are from Brazil (via Africa) and are made with black-eyed peas. They are a common street food in Bahia. Cumin is not typically used. Yum! Love falafal! I’ll try this someday when I buy a food processor (it’s on my wishlist along with a stand mixer). I’m contemplating buying both as a 60th bday present to myself (next year). Nice to know you don’t actually have to cook the chickpeas just soak. Until then I will gaze upon it longingly and practice making the pita portion! Thanks for sharing! I am forever disappointed when we take Arab food and call it Israeli. This is not our food. It’s tasty and great but call it what it is. Did I call it an Israeli dish? 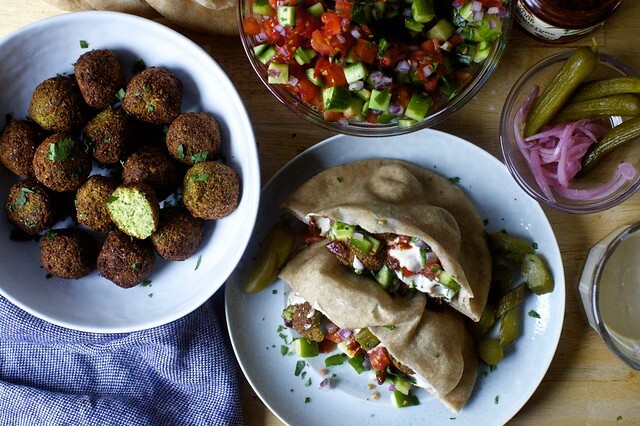 This post is tagged both Middle Eastern — because falafel is Levantine and Arabic, primarily Egyptian, in origin — and tagged Israel, where it is the most popular street food, even if it’s originally from elsewhere. I’ve been following your food for years, and one of my favorites is your brown butter rice krispie treats. Although you may not have said that falafel is Israeli, it was insinuated, and it’s important to be explicit. Otherwise it’s problematic because when Arab food, especially Palestinian, is labeled as Israeli, it’s being culturally appropriated. It is part of the rhetoric to assert that Arabs and Palestinians don’t have their own culture and history. It might be Israel’s “most popular street food”, but it is not Israeli. As someone who is fond of food, it’s imperative to know the origin of dishes. Each dish tells a story, and falafel is one of the many amazing dishes that tells the story of Palestine. There’s a beautiful history to Palestinian food worth looking into because of its simplicity in ingredients and bold flavors. It’s incredible the things that are done with basic things like chickpeas, lemons, and olive oil 🇵🇸🇵🇸🇵🇸 . The best falafel I ever had came from a Falafel shop run by Israely family. In fact all the falafel that was any good came from Israely places or Jewish take outs and delicatessens. It’s not the toughest thing; it’s going to fight you on potatoes a little. I mostly liked it for making neat cubes of things (where the appearance matters to you) fairly easily but I think there are better choppers out there when the shape of the chopped item doesn’t matter. Waitrose, the British supermarket chain, sells bags of fresh, cubed potatoes, about that size. My SIL uses them to make roast potatoes and they are amazingly good. If I wanted to make this today, what is the minimum amount of time the chickpeas need for soaking? Is there a way to speed up that process? 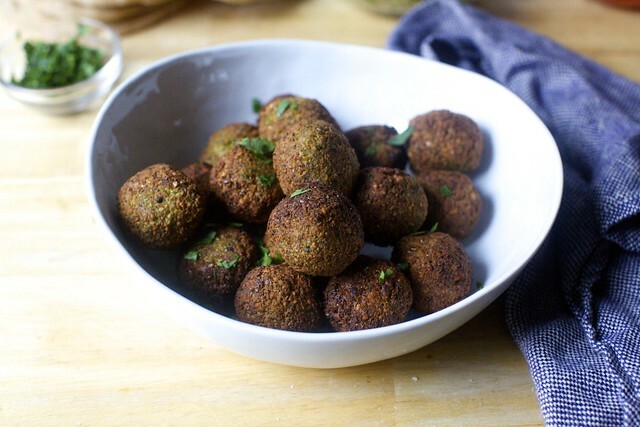 I’ve been making falafel for a few years – the chickpeas need to soak 12 -18 hours minimum. Sorry! I found that the chickpeas grew in weight and volume by about 2.2x, so 1 1/4 cups of dried chickpeas turned into 2 3/4 cups once soaked overnight. (They won’t grow further, however. J. Kenji López-Alt was nice enough to figure out for us a while ago that they pretty much absorb all the water they’re going to in the first overnight, so there’s no harm if they sit in water longer. I’d imagine the opposite is true. Maybe 4 to 6 hours is enough? I felt the same way you did about falafel until I tried it! Now it’s a summertime standard around here – so great for picnics and packed lunches, too. I pan-fry it in little patties because I hate dealing with hot oil and it’s easier to make sandwiches with. I’ll have to try your pita bread – I didn’t have success with it, so we honestly just use homemade French bread. Just made these for lunch and they are great! Have tried making falafel before but not as successful or easy as this method! Yes, because they’re not cooked. They’re just soaked and then ground for that traditional not-totally-smooth falafel. Canned beans blended would give you a bean puree or hummus texture. I am desperate to make this, but my son is very allergic to tahini. I am all about the sauce, is there another sauce we can make? I never know how to dispose of the oil…I have a jar or two of used oil in glass jars in the garage until I find out or just take it to the auto oil disposal…I know it shouldn’t go down the drain, so what do people do? My other thought was to pour it on a pile of paper towels then into the trash but that seems so wasteful of paper towels. What to do? Thanks! since i don’t fry that often, i just buy the smallish bottle of vegetable oil at the store. i use the whole thing, and then when the oil is cool, i pour it back into the plastic bottle and throw it in the garbage. if i’ve only used it to fry something “clean” like tortilla chips, i’ll still pour it back into the bottle, but label the cap with an “F” for frying oil and re-use it a few times first before disposing of it in the same way. If you have access to one, used frying oil can also be added to a compost pile. i don’t work for them or anything, just figured if you ever had occasion to be wandering around the east side, you might want to know it’s there. and also i’ve not been able to eat falafel from anywhere else since, because it all always tastes so mealy and dry by comparison, even with all the delicious condiments. but if there’s another thing i know, it’s that i’ve yet to be let down by a smitten kitchen recipe, so i’ll have to give these a go. A quick question about spices: have you ever tried in your experiments to add ground coriander? It balances well the cumin and it makes the falafels more appealing to people that are not so fond of cumin’s earthy taste… (but cumin is great with chickpeas and beans because it helps digestion and reduces gas). Personally I use yogurt instead of water for tahini sauce, it adds tartness and creaminess. Better go soaking chickpeas ! Yes, I’ve read it works well here. I also had wanted to talk a bit about purist falafel (just chickpeas and salt, no herbs or spices) but that for another conversation. I tried these but they would not hold together and to me weren’t THAT much better than when I make them from the mix (I know!). They were a ton of work and I don’t think I’ll make them again. I love the waffle maker suggestion. Has anyone done a baking alterative? Mark Bittman has a great baked falafel recipe. Hi! Just wondering if you think this would work with lentils or another type of legume. Chickpeas really don’t agree with me. Thanks! 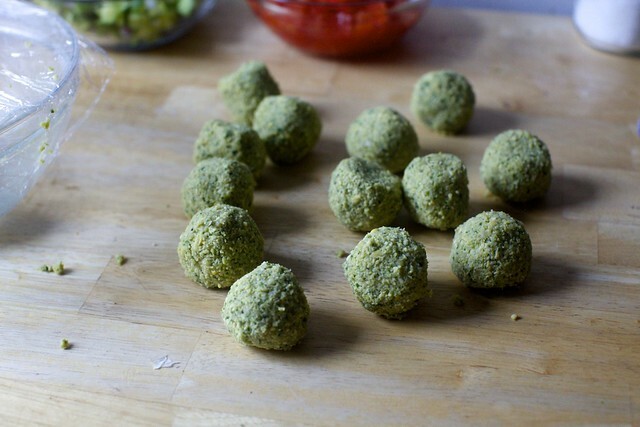 Traditional Egyptian falafel is made with favas. Lentils sound good but I haven’t tried it, of course. Do let us know if you do? This falafel recipe was outstanding! Best I’ve ever had. The pitas were delicious too. Yes, it’s absolutely not meant to be made with canned chickpeas. Truly spectacular, I made it with the Israeli tomato and cucumber salad. I’m so glad that you gave us this gift Deb! Incredibly delicious, and added to the regular rotation list. Thank you always for keeping us avid home chefs inspired! This is almost the same recipe I use and it’s practically foolproof! (mine has 1/2 tsp coriander and 1/2 tsp baking soda) I usually make a double batch and freeze most of them after I have shaped them into balls or patties. I fry them either straight from the freezer, or thaw them if I have actually planned ahead (ha!) and it works both ways. I think I have used them after 6+ months frozen and they were still good. I made this recipe for dinner last night exactly as written, and it was perfect! Had them over the turmeric-cumin rice from the street cart chicken recipe in Smitten Kitchen Every Day. It was like the best version of those fast-casual Mediterranean bowls, with the bonus of having leftovers! Thanks for this tip! Store bought pitas are always disappointing and I didn’t feel like making my own so the street cart chicken recipe rice was perfect! Made the tomato cucumber salad as suggested and they were great bowls (and even better leftovers actually!). Maybe chilling them is the key. I have tried to make falafel in the past but they just fell apart when I tried frying them. You have inspired me to try again. And if I succeed, then I have an excuse to buy a new gadget :). I’d think so. But, I also think that once you have the oil out and going, you might as well just fry them up, because fried food generally defrosts and reheats well. I made this last night (with the homemade pita). I don’t know why I got it into my head that this was an “easy” project – I started at 5:30 and we didn’t eat until 8:30 (soaked the beans while out and about during the day). Aside from that (which was my own fault), it went well, except even with an hour of chilling, the chickpea mixture could not be rolled at all. I finally added 1/4 c flour (to a double batch) and I was able to press them into an ice cream scoop with a “push forward flipper” ejector method (rather than the scraper ejector method, which just caused them to crumble) and then plop them out as little half domes and fried them that way. Any time I tried to roll them they just crumbled. Not sure where I went wrong, but my half domes sure ended up tasty. Tell me more about the chickpea texture once ground — my impression is that if the chickpea bits are too coarse, it won’t pack, but maybe it’s something else. Did they get to soak overnight? They soaked from 10 am to 5:30 pm (we don’t plan meals in this house – day of is exceedingly in advance). I processed them until they were mainly the texture of cooked cous cous, with the largest pieces (and there weren’t many) about 1/4 of a kernel of corn size. The mixture seemed very very wet to me (my pita needed some extra flour as well), maybe it was all the humidity from the 2 days of rain? I will say it was the first time I have ever deep fried anything in my entire life (I don’t know why I had a phobia of deep frying, but making caramel doesn’t scare me a bit), so thank you for enticing me to get over that! I had exactly the same result! The chickpeas were soaked for about 16 hours, and the mixture was chilled for 3. It was still very wet and wouldn’t hold together at all. (I admit that some swearing was involved.) I don’t know if it was just the wetness or if I didn’t grind it fine enough, but adding 1/4 c flour (single batch!) at least allowed me to form it into patties, but not balls. I drained the soaked chickpeas for 10 minutes or so, but I think next time I would drain them on paper towels so they’re really dry before using them, and grind them finer. But it was all worth it in the end, because it was delicious. My husband even said he thought it was the best falafel he’d ever had. I actually liked making patties instead of balls because I didn’t need as much oil to cook them. I made this over the weekend and also had a very wet result. Chickpeas soaked for almost 24 hrs and then drained in a collander. I didn’t think to add flour, but I was able to get them to hold together very carefully once I pressed as much liquid as I could out. They were not about to rolled though! I was surprised, as all of your other recipes have been nothing short of amazing! And they fried up okay? The mixture is damp, but when pressed into a spoon, should hold, or it might need to be more finely ground. It’s okay if it feels loose in your hands, as long as it fries up in one piece. I made these again over the long weekend. I drained the chickpeas and lightly patted them dry with a paper towel. I processed them to couscous size and then a few minutes more (probably about half or a quarter of couscous size, pretty close to puree but still pieces) and they were able to be lightly rolled (tossed?) in my wet hands after packing into the scoop with no flour necessary. Mine were also quite wet and we’re difficult to shape. I soaked the chickpeas for about 18 hours, then made the mixture and let that chill overnight as well. I followed what others here did and added 1/4 cup of flour, which helped. I couldn’t use a measuring tool to scoop them though because it still made them crumble. I shaped them into balls by hand and very gently placed them in the oil. They turned out so delicious!! The flavours were amazing, but my mixture was very loose and I was unable to form any kind of shape. I thought is was I maybe used too much herbs. We used it as a ‘crumbly topping’, which was equally good. Deb, where did you find those israeli/middle eastern style cucumber pickles that I spot in the photos? At a store in NYC or online? I went to Holyland Market on St. Marks Place. Deb, or anyone else, have you had success refrigerating them for leftovers after frying? Obviously not as crispy, but would love to still enjoy them for lunch later in the week! Yes, it happened once (just once) that there were leftovers. My husband microwaved them the next day and said they were just as yummy, although not as crisp. We made this over the weekend (along with your pita and cucumber and tomato salad recipes). It was incredible. We used our fancy blender since we don’t have a food processor and it worked pretty well. I was planning on making this tonight, so I soaked my chickpeas, but now my plans changed. Would it be better to drain the chickpeas and leave them in the fridge until tomorrow or still mix everything up and let it sit overnight? Thank you! You can keep soaking them. Is it possible to bake the falafels instead of frying and still get a good result? I just made these identical to hownrecipe was written but could not get them to come together at all! I added two eggs and it worked perfectly. Not sure where my issue came from but relieved it all worked out! I made the falafels tonight and they were absolutely delicious. I did the frying on an outdoor stove with a cast iron skillet. I did struggle with keeping the filling together when I was making the scoops. I only refrigerated the mixture for about an hour beforehand – I will try for a longer period next time. I agree that adding flour or something might compromise integrity of filling – it is delicious even though my scoops sometimes fell apart when. I made the pita too and served it all with Israeli salad and hummus. Yum!! My last attempt at falafel was an epic fail as I Did Not Read the Recipe, and used canned chickpeas rather than dry, which lead to my husband banning me from deep frying in the future. I will try these though, and hope to change his mind! I made a double batch with all cilantro because that’s what I had on hand. I chilled the mixture for about half an hour. They were a little finicky to scoop into balls, but I used a slotted spoon to lower them into the oil and they firmed up quickly and didn’t break apart during cooking. I served with a tzaziki-ish yogurt sauce, quick pickled red onion, and fresh veggies on ciabatta rolls. They were a big hit for the whole fam! Love amba and zhug! Other great things to put in the pita: pickled turnips and hard-boiled eggs. this year I decided not to wish for anything romantic for my birthday but rather I wished for a pressure cooker. I figured with the amount of hummus we eat by now, that this would be a sensible kitchen appliance despite the limited space of our small kitchen. I have always wanted to try falafel but I can’t eat onions. Is there something you would recommend to replace them, or just drop them? Just drop them, unless you’re okay with scallions. I had same result as others: too damp and too loose mixture. I tried to press them together as much as I could; I barely succeeded. I put the patties on a greased cookie sheet and baked them. I was so skeptical of how they would come out… I carefully turned them, halfway through baking time and upped the oven temperature, which I think helped. However, the results were fabulous. They tasted great!! And we had lots of tasty crumbs to throw into the pita along with the falafel patties and veggies and tahini sauce. I will make these again, but I do wish I could get some ideas about how to make the patties stick together better. Will flour do the trick as some have suggested? You can add flour but it might help to grind the mixture more. Think: couscous. And not Israeli couscous, right? I’m persevering, but I have yet to successfully make falafel that stay together. Squeezing the balls together helped a tiny bit, but they still fell apart. Would it help to drain the onion and parsley/cilantro mixture before adding the chickpeas? It was awfully wet. These were so good, thank you! I never realized how easy it would be to make these, and the lack of breading was a nice perk to avoid dough fingers that invariably form when breading. Also, I soaked for almost 24 hours and had no issues with forming the balls. Just grabbed a small handful, squeezed to get some liquid out, and then they held their shape. I love your recipes and trust you implicitly. This may be my favorite food blog. Yet this is not my favorite falafel recipe. I won’t be making it again. What did you not enjoy? These were absolutely delicious! I ended up soaking the chickpeas for 48 hours and had no problem forming the falafel balls. The tahini & tomato/cucumber salad are essential. Will be making this often! We made these exactly as written and they were wonderful! We also made your pitas which turned out fantastic. We let the chickpea mixture sit for a couple of hours and I tasked my 9 year old to shape the balls. She says “you form it into a ball, hold for 10 seconds and let the juices drip. 10 seconds exactly. Then voila!” She was right, they all held their shape and were easy to fry. It’s the first time I ever made falafel and all 4 of us enjoyed it. Thanks for another wonderful recipe and Happy Hanukkah. I have a fan for so many years, honestly since you first started. This is my first comment ever! I find that I have more time on my hands this time of year, which allows me to spend more time playing in the kitchen. My partner is a veggie, so I am always looking for new ideas. I worked hard in the kitchen making these along with your homemade pita and hummus recipes. All three were out of this world and I got rave reviews. Many thanks to you for all that you do. Wishing you a fabulous 2019. Made them tonight and they were perfect!! So happy to have success. No canned chickpeas this time and chilled for 30 minutes. I only soaked them for five hours and that was enough. We made these tonight along with some yummies from the Soframiz cookbook. We did have to throw the chickpea mixture back into the food processor to get it to stick together, but then all went well. Thanks for the best falafel I’ve had! Thank you so much for this recipe. It is perfect. I made it for the family tonight to rave reviews. My daughter who has celiac and also allergic to dairy and eggs, (doesn’t leave much), could join us. I have made falafel many times before but never the right way. I have used eggs and flour as binders but it turns out not only unnecessary but not good. Just as you said very little oil left the pan. That was also a pleasant surprise. Hands down, best falafel recipe I have ever tried! My family loves falafel, but in the past I have tried several recipes and was never very happy with them, so for years I have just preferred to buy my falafels from the farmers market (which are very good) or restaurants, etc. Your recipe showed up in my inbox and I really liked the simplicity of it and the inclusion of cilantro, so decided to give it a try. My whole family (all very opinionated foodie falafel lovers) declared these the best falafel, better than the farmers market and food carts. I soaked my chickpeas for a full 24 hours, then rinsed and let them sprout a little in the fridge and then I swapped the onions and garlic for chopped scallions as you suggested and they were just perfect! Definitely will be making these on a regular basis. I will try to bake them, but I also found the shallow frying very easy and the result was nice and crisp on the outside and very moist on the inside, not oily and pretty quick and easy. I’m one of those who had trouble with the texture – it was very crumbly and didn’t stick together at all. Some breadcrumbs helped enough to form them into very fragile patties, but even those were super finicky. I’d made a double batch of the chickpea mixture and didn’t have the patience to coax the second half into forms, so the next day I stir-fried the remainder and served it with pita chips and all the fixings; not traditional, but very well received! We really, really loved the flavors and will try this again, but maybe process the mixture longer to see if I can get a mixture that will form/shape. The smell, flavor, taste, etc. were all spectacular; I just want to get the texture right. This was amazing! Made tonight after putting chickpeas to soak at 730 this morning. Started draining at 5:00 PM and we were eating at 5:45… when does that ever happen?! Easily put together with my toddler clinging to my legs which says a lotttt. Saw some comments about the chopped chickpeas not holding together but I found that by giving it a solid grind in the food processor (until bits started to cling to side) the recipe as written is without issue and is perfect. I had a similar problems to those listed above – crumbly mixture that fell apart. (I even read the comments before I started!) However, after adding a few spoonfuls of flour to my mix, they held together wonderfully! The flavor was SO GOOD. We had them with pitas, cucumber-tomato-cabbage mixture and tzatiki. Just wanted to add that my falafel seemed to pick up more oil than I expected, but it wasn’t a problem overall. I had made the Serious Eats falafel that also uses soaked, uncooked chickpeas and, while I loved the flavor, they were super crumbly and fell apart more than I liked. Mindful of the comments here, I drained my chickpeas extremely well (sat over a colander for 20 minutes or so while I prepped everything else) and processed quite finely, not caring if it veered into purée territory. Success! The balls held together much better than the Serious Eats recipe and the result was quite tasty. 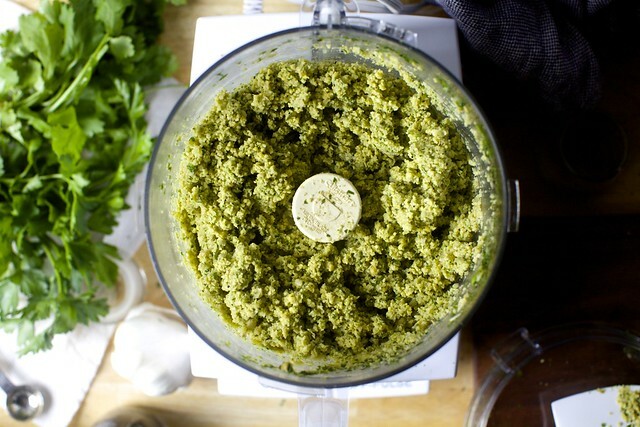 I used all parsley and an equal amount of ground coriander to ground cumin. I made a double batch and was cooking for a crowd so we baked them in the oven at 375 for 15 minutes, turned them and baked an additional 10 minutes. I’m sure they would taste better fried but this was completely acceptable. Made these for dinner tonight and they were a big hit. I couldn’t believe how fluffy they were! I used a mix of cumin and coriander but otherwise stuck to the recipe. I was fortunate to not have any problems with the mixture coming together, like others had commented on. I used my thermometer and got the oil up to 350 – they took 90 seconds to cook through. My only negative comment was that my tahini sauce had a bitterness to it – it might be due to the tahini itself or perhaps the garlic. Not a dealbreaker, by any stretch! Also, because I have celiac, I served mine on a corn tortilla instead of tucked inside a pita. My recipe made 23 individual falafels. I cooked up 6 for hubby and me and am freezing the rest. Once they are frozen, I’ll put them into packages of 5 or 6 for future midweek meals. It’s been super hot here in Australia so for New Years Eve I made your falafel. I’ll definitely be cooking them before next New Year! Absolutely delicious. I made the lemony pickled red onion from one of your previous posts plus the usual salad suspects. Thanks for another great year of recipes. I pretty much never comment, but made these today and my entire family says THANK YOU! My husband has lots of food sensitivities that have challenged me, even as a very seasoned home cook. I also have a 7 year old that has detested beans his entire life with the one exception of hummus (nothing else with chick peas is okay though.) Poor kid has to choke beans down fairly often and I hoped this might make it easier on him. This recipe was actually okay with the 7 year old (sold it as fried hummus!) and everyone else really loved it. We served them on salad greens dressed in a mustardy vinaigrette topped with cucumber, onion, and tomatoes with the same dressing over those. Then these little morsels and a dollop of lemon-garlic sour cream (out of yogurt) for most of us and lemon-garlic Vegenaise for the dh went over the top of the salad. I didn’t have time to make pitas, but will serve with those next time for those who can have them. This is going to be my go to meal for vegan/vegetarian entertaining and will be in rotation at our home as well. Thank you! I add to my Tehini: a little bit of olive oil, a little drop of something sweet (runny honey, agave, maple syrup, date syrup). It balances nicely with the salt, garlic, and lemon. I made the falafel as written/pictured here — they were perfect, exactly what I expected. Thanks for giving a first time fryer courage! Thank you very much for this recipe. 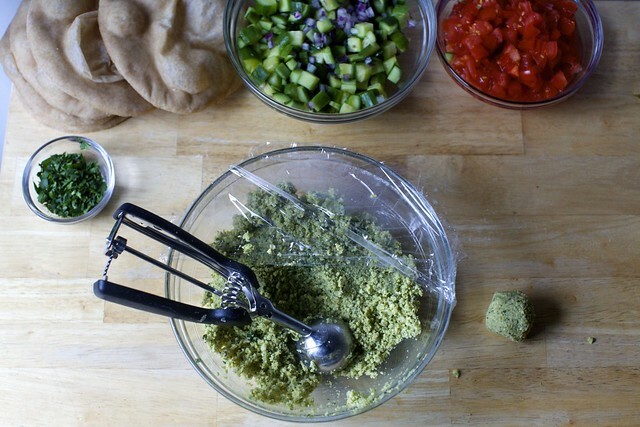 I’d never thought about making falafel until I read this post. I made it today and it came out great. I also made the pita bread which also came out great. As I saw the warnings about the falafel falling apart, I took some extra steps. When ground to the texture indicated in the recipe, the falafel mixture didn’t hold together when I pinched it. I kept grinding it until it held together. About an hour before I fried the falafel, I made the mixture into balls and put it on a baking pan which I’d lined with paper towels. I refrigerated the falafel balls until I was ready to fry them. I had no problem with the falafel balls falling apart. I made this last night for a New Years Day dinner party (along with your pita and Israeli salad) and they were a hit! I read some of the comments about the chickpea mixture not sticking together, so I prepped the mixture a few hours in advance and then set it in a fine-mesh strainer set over a bowl in the fridge. Not much liquid drained out, but perhaps it made a difference since I didn’t have trouble with shaping. Set them back in the fridge for a bit before we fried them and they turned out perfectly. I forgot to add: in addition to the suggested tahini sauce, my friends brought tzatziki sauce and a whipped feta dip-would highly recommend both. These were delicious and definitely worth making. The mixture was definitely too wet but the parsley was pretty soggy so it was user error. I just picked up blobs of the mixture and squeezed it in my hand really, really well. Next time I am going to wash the parsley ahead of time and put it in the refrigerator wrapped in a paper towel so it has time to evaporate the water. I tried making this but when I would fry them, they would just dissolve ☹️ I used canned chickpeas so I’m not sure if that would’ve made the difference but I thought it was fine the cause consistently was pretty good. Any advise for next time?? Thank you!! I never eat falafal but this looks very tasty. will definitely try to make this wonderful recipe. We made this last night (I had to leave the bottle of dried chickpeas out on the counter for a few days to remind me to start them soaking the night before) and it was fantastic, and as easy as advertised — the mixture, after chilling, was fairly easy to make into balls and they crusted right up in the hot oil. So great! And faaast! I soaked beans overnight, thoroughly drained them, then pulsed the mixture in the food processor longer than felt right but that got us the nice couscous texture that wasn’t too wet. Left in the fridge for 3-4 hours and the fritters held together nicely. I didn’t need much frying oil and they came out a nice deep/golden brown, crunchy and moist on the inside. Served with thinned out tahini, pickled red onion, cukes and jalapeno, harissa, humus (not needed) and your easy pita. Added 2-3 fritters per sammich, plus one one the side for enjoying on it’s own. Ultimately, for us, the batch makes about 4 servings plus a small snack or two (kept frozen). Mmmmmm, mmmm. The bf said the falafel were as good as his favorite–Mamoun’s!!!! Also, we made your Israeli salad and will add feta next time as well! Table looked beautiful with all the colors and textures, and it was fun to build your own. Perfect meal for a gathering with friends. I made both the falafel and the pita over the weekend. i have a few observations to share. First, i forgot to soak the chickpeas overnight, but did give them a 10-hour soak over the course of the day. I’m wondering if that was enough, because when i followed the directions to the letter, they still were very difficult to “gently roll in the palm of your hand.” they are nothing like meatballs! I almost threw the whole thing in the garbage, but I had a family to feed. So, after pressing firmly into a cookie scoop, i gently PATTED the edges into a ball. Mine weren’t as evenly fried on the outside like Deb’s, but they were still delicious and wowed my family. I count that as a win. As for the pita…i wouldn’t try making them at the same time i’m making the falafel again. Perhaps earlier in the day (making this really an All Day Affair). I didn’t have the patience (or time) to wait between baking each batch (and my stone only held 2 at a time). I also used Active yeast instead of Instant, so it took longer for the first rise. Lesson learned. Even though I diligently sprayed the pitas with water before putting them into the oven, they didn’t puff quite enough to use as pocket bread. They were still a delicious flatbread to pile falafel onto. So I’m counting it as a win. And they were great to eat with hummus i made the next day. Can I soak these in the AM and cook in the PM? How long do they need to soak? I’d assume as long as it’s 8 hours, it should be fine. Check my guideline here. So excited to make these tonight! Can I pre-roll the falafel balls and let them sit in the fridge, or do I need to roll immediately before frying? Making for a crowd and trying to cut down on the amount of work I have to do while people are hovering in the kitchen! Best falafel ever! Not even kidding, better than my favorite restaurant. So easy to put together. I didn’t buy cilantro so just used all parsley, other than that I followed your directions and they turned out beautifully. Made 19 once inch balls, had them with the homemade pita. An awesome meal for a Monday night. Mamoun’s is a horrific falafel. Does he ever change his oil? My stomach and taste buds won’t accept it. I prefer to go to Coney Island for my falafel, where people care. I like your recipes but am disappointed by this one. Overall, this recipe is perfect and will be one I make again and again. I did add about 1/2 cup flour to the chickpea mix; it was not sticking together at all, but that small amount of flour made it perfect. They held their shape 100% during frying and we loved the tiny little crunch/texture from the chickpeas, which is so different than canned. Just had leftovers for lunch and feel like this is a meal I could eat over and over! Due with a baby at the end of March and might just make a bunch of these to freeze and reheat! Another hit! I didn’t plan for a lot of resting time and only let them set for about 40 minutes. The mix was pretty wet so I had to squeeze the balls enough to hold their shape. I eventually squeezed it in some cheesecloth, which worked well. I made 19 balls, and they were fantastic! Served with tomato-cuke salad, shredded lettuce and spinach, feta cheese, garlic aioli, and zhoug (from Trader Joe’s). We will make these often! I just need to add my praise to the reviews of this recipe! First time falafel maker- I live in Utah so I do not have the luxury of amazing perfect falafels in every corner. My memory may be playing tricks, but I would say these are as good as any falafels I’ve had anywhere (anywhere = I’ve only had falafels in California and New York). Go ahead and make the pita and the tahini sauce and the salad as suggested. Delicious. I didn’t seem to have the “wet” falafel issues others had. I made these and they were super easy and delicious! Would you freeze them before or after frying? After, so they hold their shape, and so you’re not heating oil just to cook a few. Just made these. The dough is super-fragile, but they turned out great! Thanks so much for posting it (and testing it). Tip though: if you like your felafel balls a little firmer, fry them until they’re dark walnut brown, which takes about 2 more minutes. I have my chickpeas soaking now, but I am questioning why I need to finely chop the herbs *before* putting them in a food processor? Won’t they get chopped then? I made this tonight after a long day of questionable potty training. Thank you for a wonderful meal and a necessary pick me up. It came out beautifully, even with necessary modifications (no cilantro, soaking for only 10hours). We added home fries into the pita and it was delish. Long time reader, first time poster. Just finished successfully frying (no breakages or explosions!) a double batch of these after so many failed attempts at homemade falafel, so here are my notes: I added a full half cup (for the batch listed in recipe, so a cup total for a double) to the mix as it seemed too wet to form clumps. This made it pliable enough to form into patties, which I refrigerated for a while. I heated my oil and then dredged each Pattie in yet more flour before putting it into the pan. They look and taste great. With the last of my mix, as a controlled experiment, I added yet more flour – an extra quarter cup for only 5 falafel, just to see what would happen to texture and fryability. These rolled and fried like a dream but were a tad stodgy. Basically I think there’s a spectrum where more flour = more reliable outcomes in terms of frying and ease of batter shaping, but a less moist result. I’d err on the more flour side and make up for it with sauces and fixings if nervous. These are so, so much better fried than baked in my experience and I just did mine in a saucepan over the stove, 7 at a time. Thanks Deb, this was so delicious! I was inspired and in addition made the pitas, my own harissa, and tahini, and your cucumber tomato salad (but with cilantro). We loved it. Great things to do on a couple of snowy days. So I just made these today and some of mine basically crumbled in the oil, the ones that made it tasted great! Just wanted to ask what I did wrong. Started with dried and soaked overnight, maybe I didn’t grind enough? Is it suppose to be paste like? I made these with canned chickpeas and they completely fell apart. I ended up having to mush it all back together and added flour and eggs, which couldn’t really be formed into a ball (more of a mushy batter at that point) but formed really delicious patty-type fritters that were amazing with “the works” (tabouleh, feta sauce, etc). I’m seeing that other recipes include a little bit of chickpea flour. Next time I would definitely try with dried chickpeas and some chickpea flour for binding. I made these last night. I actually made and rolled the batch and then froze them three weeks ago, then last night popped them in the oil. They were awesome! Thanks, Deb! I made this tonight for dinner and it was delicious!! I changed two things —I forgot parsley so I doubled the cilantro and BAKED them,instead of frying, at 400. flipping them at the 15-20 mark and baking for another ten minutes. Used about 2 tablespoons oil on the bottom of the sheet pan and brushed the tops with another half! So good! I made these tonight with great success! I read through the comments and adjusted accordingly. Processed to oblivion in FoodPro. Mixture in fridge for 90 mins. Formed easily into balls and fried per direction. Our 9 month old was way into it (and the King Arthur potato flour pita we decided to make with it! ), but I’m wondering about oven baking it in the future— obviously won’t be as crispy but think it could be done and hold together? Press into muffin tins? Spray with oil? Thoughts? I did try this but my falafel mixture would not stick together. Let the mixture dry in the fridge for 2+ hours. Don’t think adding flour will help the mixture stick together so am going to try and fry it as a patty or patties? what did I do wrong? Maybe I didn’t puree the mixture enough? Didn’t let them soak long enough – 8 hours. Help! I just made these and my picky 4 year old was fighting for my sandwich (despite the presence of spinach, which she refuses under all circumstances until now)! I was running late getting home from work, so these were soaked ~20 hours, puréed until very fine bits (couscous is probably about right), rested in fridge maybe 20 minutes. It required a gentle hand to form balls, but they firmed up as they fried. I did have a couple casualties due to disintegration in the oil, so kept the rest of the formed balls in the fridge until the oil was ready for each batch which gave better results. Thanks for giving me the confidence to try this! I can definitely see keeping some of these in the freezer at all times for quick and easy meals. Warning: When heating your oil, don’t blindly use the “five minutes on high” guideline like I did! 3/4″ of oil (I measured the depth when I poured it in) in a 12″ skillet over high heat for five minutes got WAAAAAAAAAAAAAAAAY hotter than 375. My tester falafel ball incinerated instantly, smoked out the kitchen, and filled the fry oil with nasty bits of charcoal. Omg I made just the basic ones of these falafels & they turned out spectacular !!!! I made some homemade taziki to go with them & omg — so wonderful ! It makes a ton ! I got a food processor as a Christmas present & was stoked I got to make these again. I had to leave them in the fridge for a few hours because I couldn’t get to it right away but they turned out great still ! Thank you so much we all loved them ! Going to make more tomorrow lol . I made this tonight with spinach and it was even better! I just cooked 5 oz of spinach in a skillet, squeezed out the excess water, and threw it in the food processor with the chickpea mixture. It was almost as good as the spinach falafel at Oleana in Boston. This worked for me exactly as you said it would. I found that if I squeezed each ball together first and got some liquid out of it I was then able to roll it into a ball. I rolled and fried one ball at a time and by the time the sixth one went in the first was ready to turn. They are so nutty and toasty on the outside and so fresh and green tasting on the inside. My husband loved them and our 14 month old was signing “more” after her first bite. I have to admit I think these are better than most restaurant falafel. For those struggling to form – the mixture is wetter than you think it will be and you do need to squeeze before you roll, but if the oil has come up to temp they’ll hold together if lowered in with a slotted spoon. Great recipe, Deb! I was thinking just like you before I made my first batch of homemade falafal. But they are so simple to make and take so little time to cook once you’re familiar with the recipe. The first time I made them I followed Ottolenghi’s recipe from his cookbook Jerusalem. He coats the falafel in sesame seeds before frying. This makes them extra crispy. I will definetely give your version a try. Thank you for all the great content, Tim. We served the falafels with a bit of grilled marinated chicken breast (cut into strips) two kinds of hummus, zhaug, kalamata olives, tzatziki, pickled red onion strips, pickled radishes, raw lettuce leaves, and lightly seared asparagus, small red peppers, and grape tomatoes (it’s winter here: raw vegetables seemed like they’d be weird. Putting a sear on those was just perfect.) I flaked out and bought the pitas this time, but I made them the previous time, and it was simple and yummy superior. Definitely trying this one! I do have one question though. At what point would I freeze them? Before or after frying? Had these last night and they were delicious, even without most of the parsley and cilantro (mine wilted too soon). A datapoint: I soaked the beans two nights in advance, then blitzed up the mixture the next day and put it in the fridge. I didn’t end up making them until the night after that, but they didn’t seem to suffer for it. The mixture seemed very wet but it held together (I added a tbs of flour but it didn’t really make any difference) just enough for only one or two of my patties to fall apart when fried. I made slightly rounded patties, the way they come out when you squeeze the ball between your palms. They tasted really good. THESE WERE SO GOOD!! I was a little nervous because some folks had issues with them, but ours turned out perfectly. We soaked our chickpeas (from Rancho Gordo) overnight with salt, drained for about an hour, and processed about as fine as the processor would get them. They were a tiny bit crumbly but held fine in the oil, and were soooo delicious. Will definitely make again!